Loud Ninja Games headed up by designer Eli Arndt have released three new 15mm packs into the part of the range 'Wasteland and Mutants' on their page at 15mm.co.uk. They join not only the other packs in that part of the range but of course the Alien Encounters, Ikwen, Yandrassi and the Chuhuac with over thirty codes into total! Go HERE for the whole range and you can refine by search for only Wasteland packs if you wish. 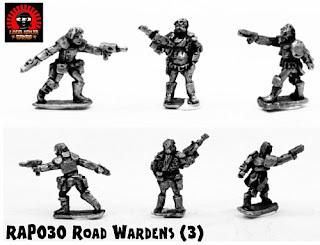 The three new packs are excellent for present day gangers, post apocalypse raiders, near future hunters and most anything else that needs weird and wonderful in 15mm scale. Highly detailed white metal miniatures sculpted by Eli Arndt. Here are the details. Go HERE. This pack contains three different highly detailed 15mm scale white metal humans with pistols and a rifle all wearing light armour. Even in the wastes there are those who cannot abide evil. These brave men and women take up arms in the name of something more than simple survival and take to the roads dispensing justice. They are known by many titles but often go by a more classical, romantic title - Road Warden. 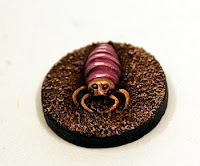 All miniatures are supplied unpainted and without bases. 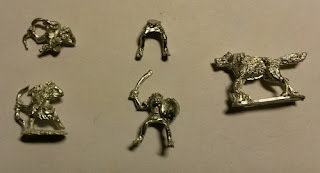 This pack contains five different 15mm scale white metal radioactive zombies in various poses. Exposed bones, melting flesh and grinning skulls these are scary foes! In the wastelands and the ruins of the old world, there are those who have been so changed that even after death they continue to menace the living. Whether it is through strange energies, chemical cocktail or mutant virus, Rad Zombies now roam where man once dwelt seeking to feed their insatiable hunger. All miniatures are supplied unpainted and without bases. This pack contains nine different 15mm scale white humans in various poses. Crude weapons, scavenged firearms, punk style hair, rough clothing these are the guys that haunt the innocent in a nightmare future. In the shadow of the world before there are those who are so intent on survival that they leave behind all pretence of civility and community, choosing instead to make their fellow man their prey upon which they sustain themselves. Those who take to this life live as bandits, raiders, and much worse, banding together to use might to make their living as Wasteland Raiders. 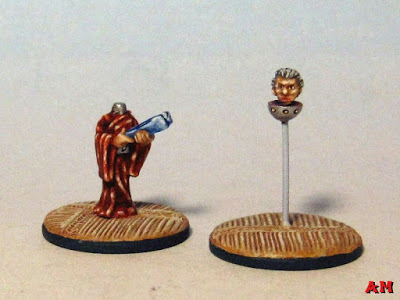 All miniatures are supplied unpainted and without bases. These new packs go excellently with the fearsome Terrorclopes and the helpful Wasteland Buddies as we as the not pictured here Mutants and Super Mutants in the range. RAP028 and RAP029 Sculpted by Eli Arndt and painted here by Sam Croes. Enjoy! As a fan of fantasy wargaming my favourite scale is 15mm as it allows you to field impressive looking forces without taking up huge amounts of space and can also be achieved without considerable expense. Both of these things appeal to me! 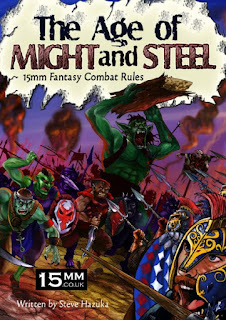 Over the last few years I've used the Age of Might and Steel (AoMaS) rules as they are quick to learn, fun to play and flexible enough to be used for games of a few units a side up to major battles of several hundred figures. The rules are on the website as a paid for PDF download. 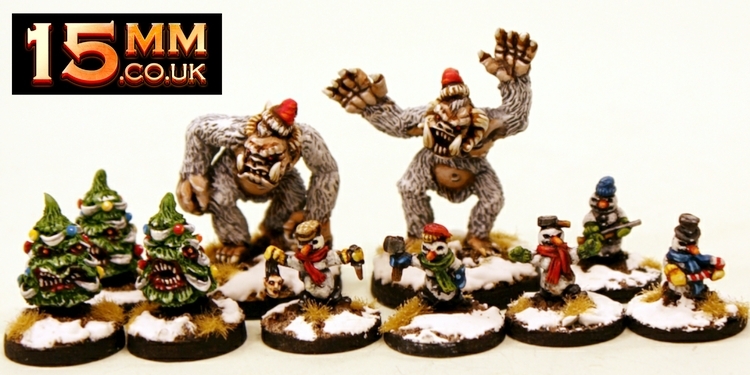 The fantasy ranges at 15mm.co.uk cover all the unit types available with many of the monsters being interchangeable between armies. 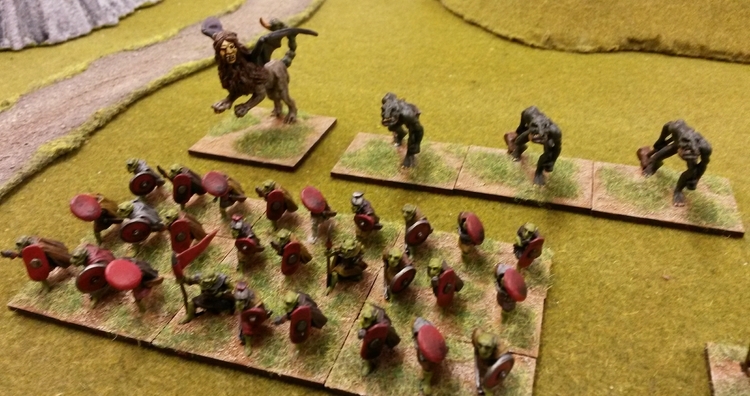 Since reading the Lord of the Rings as a child I've always had a soft spot for goblin wolf riders (someone has to) so the first force I decided to build was goblins. For those of you who aren't familiar with the AoMaS rules, all the main units are made up of figure stands with a 40mm frontage. 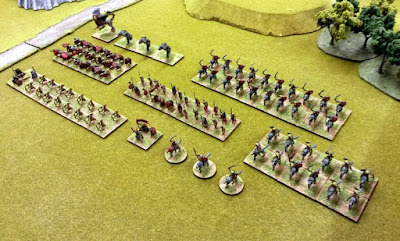 Infantry are based on 40mm x 20mm stands with 2 figures for light infantry or archers, and 3 for medium and heavy infantry. 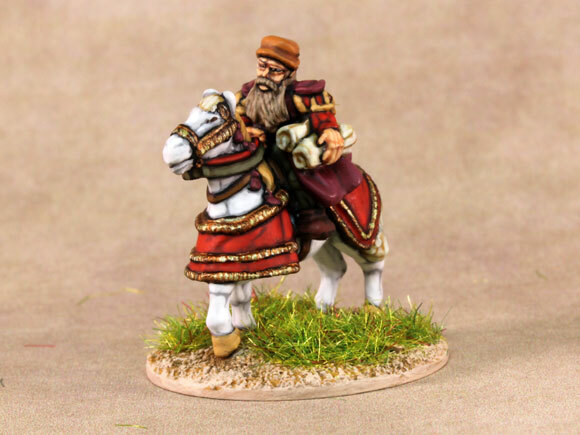 Cavalry are based on 40mm x 30mm stands with 2 figures for both light and heavy cavalry. 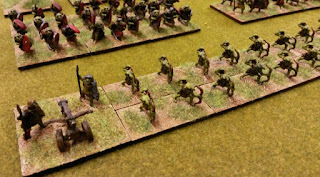 Heroes are based on 25mm x 25mm stands although I generally use 25mm round stands to make them obvious and I like to use a bigger stand for the army general. Special stands such as war machines and monsters can be based as you like but I still use a 40mm frontage, with 30mm, 40mm and 60mm depth according to the size of the model. Element Bases to use are HERE. 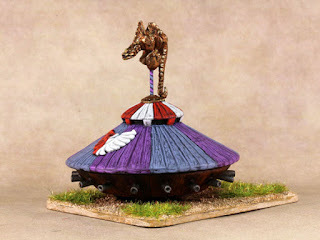 It's no surprise that my first unit choice was wolf riders but they're a compulsory unit in any case. Using pack HOT5, you get 10 wolf riders in each pack which gives you 5 stands. I wanted a unit of 10 stands which would therefore need 2 packs. If you buy 3 identical packs you get a 10% discount (use the drop down menu on the product page and select three packs) which is excellent value, and in the end I bought 4 packs but more about that later. 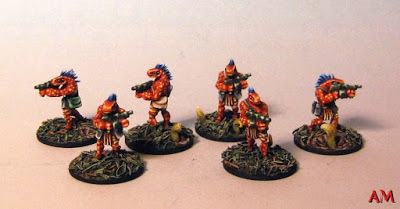 I then wanted some ordinary goblin warriors, which are medium infantry and the other compulsory unit choice. 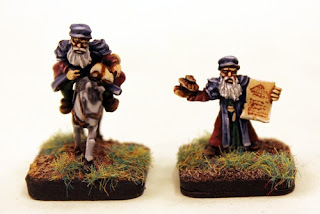 These are provided by pack HOT4 with 16 figures supplied per infantry pack. I wanted an 8 stand unit so 2 packs would give me the 24 figures I needed with a few left over. This gives you the units you must have (apart from heroes and magic users), so now you are free to choose units that match your playing style. 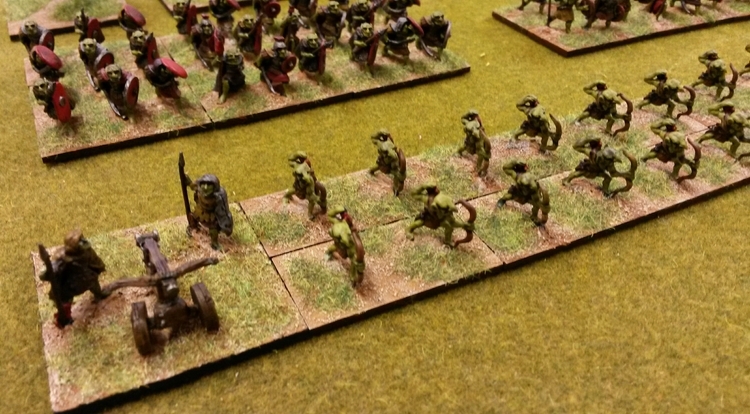 I decided on some goblin archers to provide ranged attacks. These are supplied by pack HOT61, and as I wanted an 8 stand unit with archers based 2 to a stand I only needed 1 pack. As heavy infantry are a useful unit to have I wanted some goblin knights. These were supplied using pack HOT4A from the orc range. The more heavily armoured figures work nicely. I wanted a 9 stand unit to form an attack column so 2 packs supplied the 27 figures I needed with a few figures left over for unit leaders. For the final unit in my basic army I decided that I wanted some more wolf riders but this time I wanted mounted archers. Although there isn't a specific pack for these they are easily created using the regular wolf riders in pack HOT5 (I mentioned that I bought extra packs) with the riders clipped through at the waist and then another pack of goblin archers HOT61 also clipped through at the waist (but being careful to trim round the quiver). Please see the attached photo. Make sure that the 2 halves are trimmed to a flat edge and they glue together nicely. 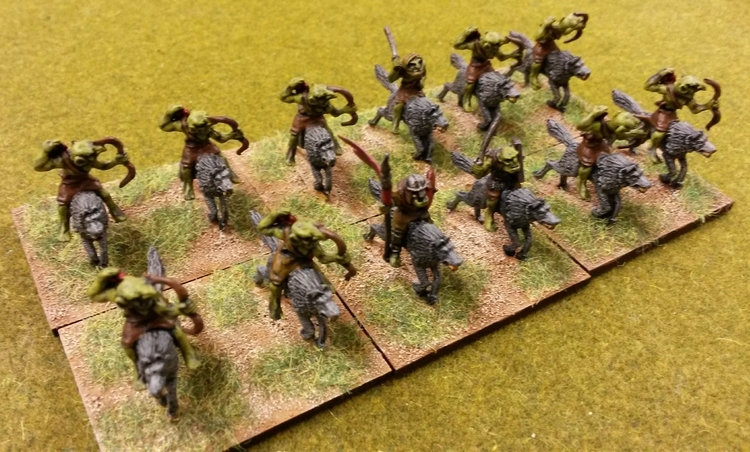 I wanted 6 stands so I still had some wolf riders left over for mounted characters. 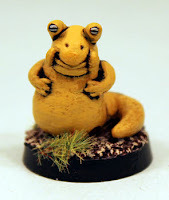 In AoMaS you are allowed Special Stands in ratio to the number of units in your Army, and the ratio varies according to which Fantasy Race you are using. All armies must have a general. For my general I bought pack HOT3 which includes a goblin king with an axe along with bodyguards so job done! 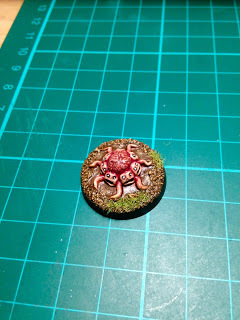 I put him on a 30mm x 30mm base to make him stand out. The kneeling warriors with spears were used as standard bearers for my units. I then based 3 wolf riders individually on 25mm round bases. 1 was painted as a magic user with the other 2 painted as heroes. To bolster the size of my archer unit and give some longer range shooting if I needed it I purchased a goblin bolt thrower pack HOT16. For my initial monster choices I bought 3 trolls using pack HOT3A. Trolls are supplied individually but again by buying 3 there was a 10% discount. Then I also bought a Manticore which are supplied singly in pack HOT28. The total APV of my goblin force is 430 which is a good size to start playing with. Heavy infantry are slow but solid in combat against all other units. They should anchor your line where needed. The medium infantry are faster and good at holding the line against other medium infantry or light troops. Archers provide ranged attacks but may not charge into combat so you need to be careful where you send them. They are useful for holding terrain features or objectives and move as light infantry so move quickly even in dense woods or rough terrain. Remember that war machines move as heavy infantry though so if you need your archers to move quickly don't attach a bolt thrower. As light cavalry the wolf riders are fast and can move around the flanks, but be wary of heavy cavalry. As a special rule wolf riders add +1 to their dice roles in combat but if you want to take on the heavies it wouldn't hurt to involve a hero in the combat as well. Of course if you can get in a sneaky flank charge that's even better. The wolf riders with bows cannot charge into combat due to being mounted archers but are useful to the flank or rear of the enemy. They can fire from a march column formation which can be particularly effective. The Trolls count as a stand each so can boost the size of units when attached, but the Manticore is the most effective when attached as it provides magical attacks giving you -1 on your base number. After playing some initial games, this is a good all round starting force, but may not work with all scenarios. I plan to add an additional unit of wolf riders, heavy infantry and medium infantry to my collection in the near future. This will give me more tactical options when selecting a force. I've enjoyed the whole process of building and painting this army and although it isn't the toughest it's fun to play with and when all's said and done that's the most important thing for me. 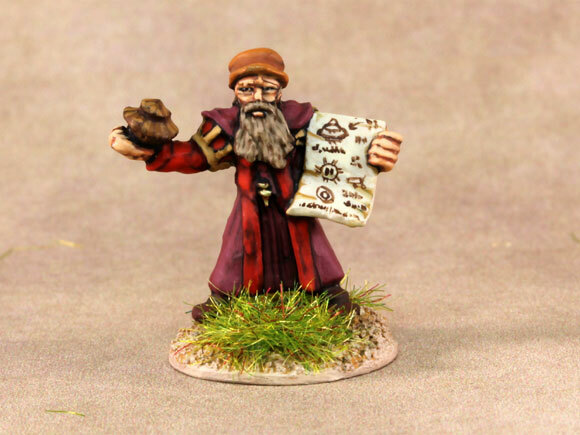 Our fantastic 15mm scale renaissance fantasy packs have been painted up by the multi-talented Steve Dean! Leonardo Da Vinci and his proposed design for a tank too. You can visit the original post on Steve's forums HERE. In this short article I have put up the images from that forum post for you to enjoy. Steve plays a lot of different periods and paints a huge array of different miniatures. His intention here is to add these to his fantasy armies in 15mm scale. To that end using his 'Bitz Box' he made some alterations to the standard miniatures and model. 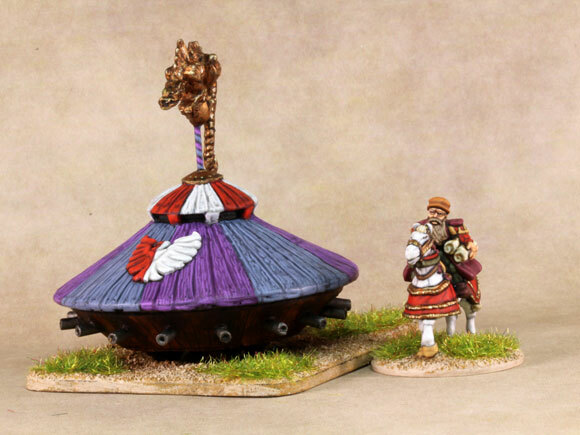 Da Vinci himself is mounted on a different horse to the one we supply and the Tank has a very nice and ornate top piece added. As well as this banner top piece the front of the tank has a crest added. It shows just what you can do with this model. Enjoy the pictures and thanks Steve! Above you can see our own version of the Tank and of the inventor, artist and great man himself too. These show what you will get (unpainted and unassembled) when you order the packs from us. Click on the links to HOT101 Da Vinci Tank and HOT102 Leonardo Da Vinci to go to our website. You can purchase one pack or click on the drop down menu to select 'buy three save 10%' option for more value! Neal Key is a keen wargamer who has recently placed his virtual toe into the realm of blogging. As a fan of our miniatures and centrally the excellent SHM Range where new designers get to show off their weird and wonderful ideas and talent he has thus far only a handful of posts on his blog. 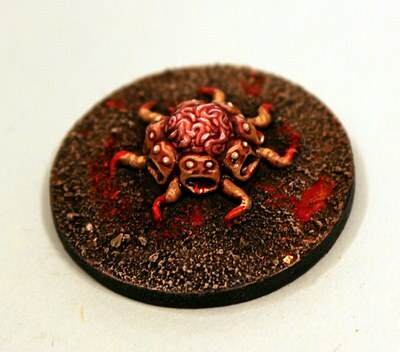 This will increase over time as Neal says but this time he is all about his painted SHM61 Collective Mind Monster. You can see it above and to read the full blog post go to his page HERE. Well done Neal! Above is our own image of this code. Its one of many creatures in the range by Fjodin. 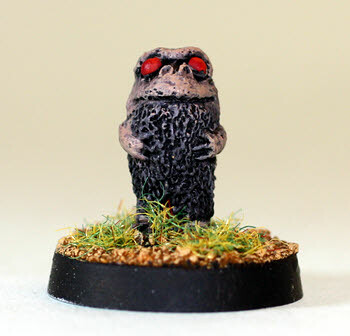 His others include Creatures of Horror, Swampers, Mollusca, Nessite, Slurmite, Avarep Cobra and Galdor Burrowers as well as the chomping Krators! Images of some of these blow but you can see them all on our website HERE. 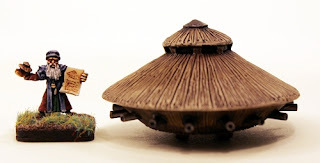 These alien creatures are great for gracing your battlefield and making vignettes or perhaps an alien safari or two. Welcome to the New Year, to the sixteenth year of this millennium in short to 2016. 15mm.co.uk had a good year over the last twelve months and we hope to do the same this year. We would like to thank you all for your support of us across our various brands and scales of wargaming and figurines. We have an awesome year planned out ahead of us and while we will not be giving away everything that will occur (where is the fun in that eh!) I can give some hints as to what to look out for during the winter and into the spring and hopefully when the weather improves here in Scotland. 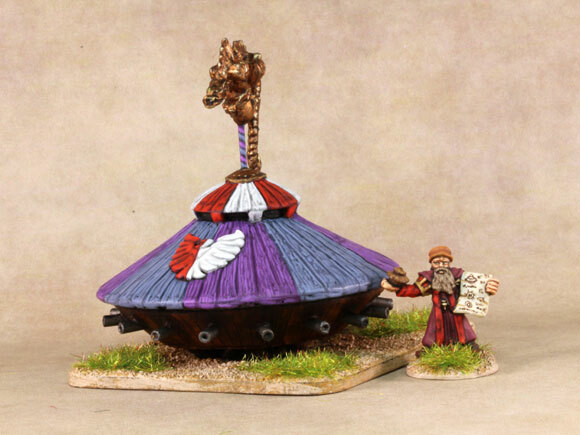 We shall be expanding our 15mm Fantasy ranges such as HOT and Tabletop Fantasy. With re-mastered and molded classics and new codes too. A couple of our HOF packs will be withdrawn in favour of a second version with greater features of the same codes. This will be the Charger and the Maginot. We are now beginning to work on a large focus wargame system which will be released in 2016. Our range of fantasy buildings will have a new set and singles released following upon on the Human and Orc buildings. What else....a lot...but that would be telling! Lastly remember you only have until the 11th January to get your Evil Snowmen, Killer Xmas Trees and Abominable Snow Monsters from our festive range before they are withdrawn until this December. Go HERE.